FULL TIMEPort Adelaide have been dominant after quarter time kicking 20 goals to 4 to defeat a very disappointing Brisbane Lions by 113 points. GOAL POWEREbert marks a split second before the siren sounds. He goes back over the mark and ices the cake for the Power. GOAL POWERSchulz marks it 15 metres out all alone. He looks to be put around on the angle but the umpire is generous to him. He comes in and kicks goal number 7. 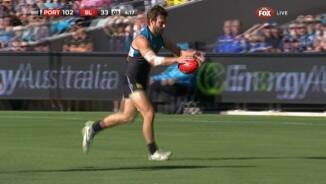 Port Adelaide have put on a real football clinic today and they must love playing at Adelaide Oval. 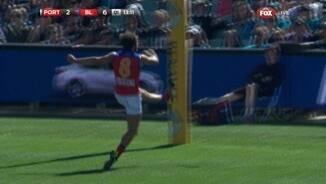 GOAL POWERSchulz wins the free kick for holding the ball 12 metres out. He goes back and goes BANG! He has 6 goals and the Power lead by 101 points. GOAL POWERSchulz marks it in the pocket and this time he makes amends for his earlier miss. How dare he miss! Schulz has 5 and the Power lead by 95! BEHIND POWERA rushed behind for the Power with the Lions looking forward to the flight home. Lions InterchangeRyan Harwood off due to an injury. Power InterchangeMatthew Broadbent off due to the blood rule. Power InterchangeSam Gray off due to an injury. Welcome to Adelaide Oval for the Port Adelaide v Brisbane Lions Round 4 clash. 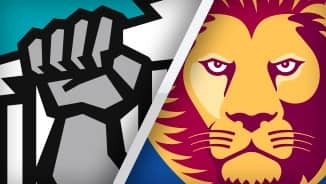 IT HAS been a disastrous day for the Brisbane Lions at Adelaide Oval, losing ruckman Matthew Leuenberger to a serious knee injury, and losing to Port Adelaide by 113 points. Jay Schulz booted seven goals for the Power as the home team destroyed its hapless opponent, 24.15 (159) to 7.4 (46). Adding to the Lions' woes was the loss of star midfielder Pearce Hanley. Leuenberger will have scans on his right knee and Hanley strained a hamstring. On top of Schulz's big bag, Justin Westhoff, Matt White and debutant Sam Gray each kicked three majors. 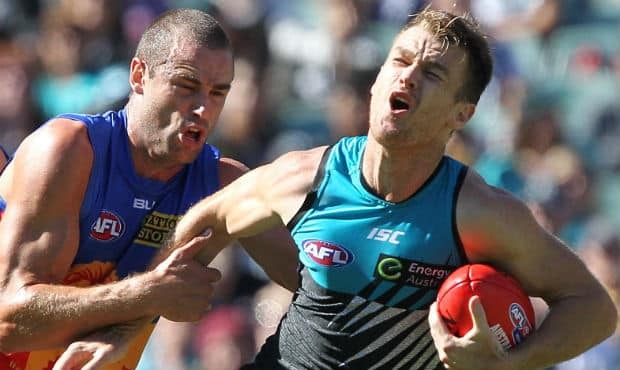 Power captain Travis Boak (41 disposals), Kane Cornes (38 possessions) and vice-captain Brad Ebert (35 touches) were outstanding before a 36,231-strong home crowd. The Lions had no clear winner apart from Tom Rockliff (31 disposals, 14 tackles) and Rohan Bewick, who kicked two goals. The Lions kept pace in the first term and trailed by eight points at quarter-time in a heartening opening. 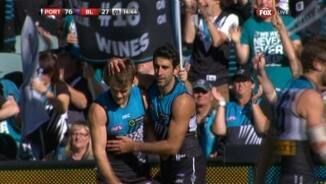 But they were then blown away as Port booted 14 goals to two in the second and third quarters. 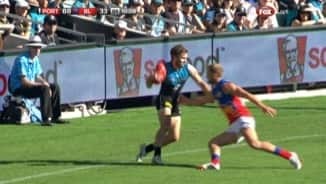 Boak, Ebert and Cornes ruled the midfield and fed a hungry forward line, where Schulz and Westhoff were ever-present threats, taking 17 marks between them. 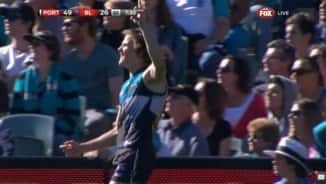 And when the ball hit the ground, goalsneaks White, impressive first-gamer Sam Gray, and Robbie Gray (two goals) feasted on the crumbs. 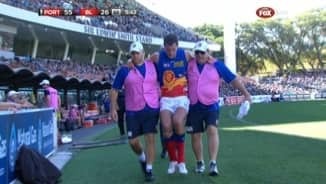 The Lions' cause was hampered by the loss of tap-man Leuenberger, who hobbled from the ground in the second term after injuring his right knee in a tangle with opponent Matthew Lobbe. After the game Lions officials were hopeful that Leuenberger avoided damage to his anterior cruciate ligament, with scans to determine the exact nature of his injury. Hanley limped off in the third quarter with a hamstring strain and also appears certain to miss games. "There are a lot of parts that we need to coach better and there's parts the players have to take ownership of as well," he said following the game. "What tends to happen when the scoreboard really blows out, a bit of self-preservation comes in, you forget all about your team structures ... there is a bit of that creeping in." Port coach Ken Hinkley described his team's performance as "brutal". "We haven't been able to, probably in my time, be able to put together really a pretty strong four quarters of football and the boys were able to do that today," Hinkley said. "Our defensive pressure all over the ground was pretty pleasing and we wanted tocome after them as much as we possibly could. "The Lions had a young side out there, there's no doubt about that…[but] I love the ruthlessness about keeping on going and the preparedness to keep working. "It was a comprehensive, brutal performance."